An award-winning documentary Jane Goodall wants millions to see is coming to Idaho. 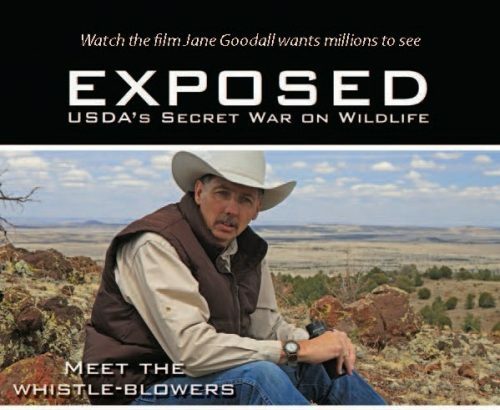 The film, “EXPOSED: USDA’s Secret War on Wildlife” – produced by Predator Defense Executive Director Brooks Fahy – features three former federal agents and prominent Oregon Congressman Peter DeFazio blowing the whistle on a barbaric and wasteful program within the USDA called “Wildlife Services.” It exposes the government’s secret war on wildlife on the taxpayers’ dime. Every year agents from this program kill millions of animals across the nation. They are highly active in Idaho, and their methods—which are taxpayer funded—ignore science, harm humans, and kill pets and endangered species. Idaho has earned a reputation as the country’s biggest wolf-killing state by slaughtering close to 2,000 gray wolves since 2011, when they lost federal endangered species protection and management was turned over to state wildlife agencies. Idaho has even allowed Wildlife Services agents to gun down wolves from helicopters over the “Lolo Zone,” a prime wolf habitat in the North-Central part of the state. The Lolo Zone features some of the most rugged and beautiful public wildlands in the Lower 48. Idaho’s stated goal is to reduce their wolf population to 150, a scientifically disastrous objective that destroys the positive effect apex predators have on ecosystems and the biodiversity they foster. Wildlife Services is charged with taking out any threat to livestock—real or alleged. This killing is done largely for the benefit of private individuals who don’t take responsibility for protecting their animals. 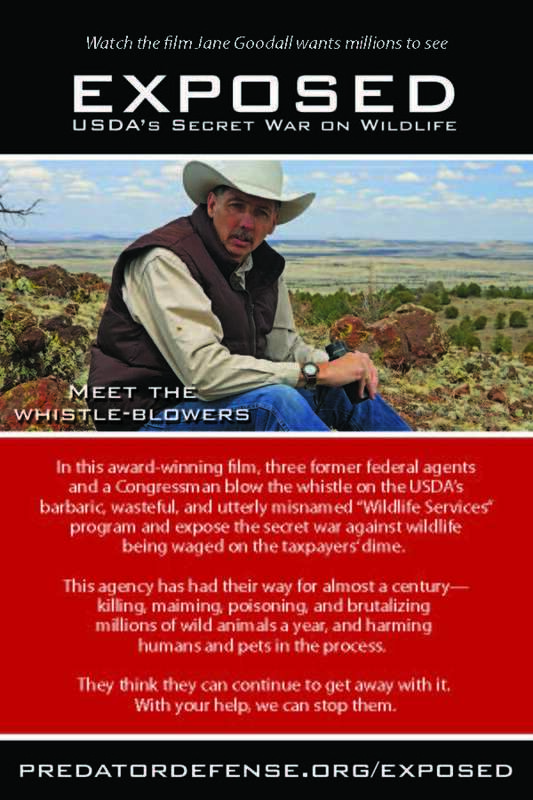 The whistle-blowers in the film “EXPOSED” reveal deeply entrenched problems within this federal agency, not the least of which is lack of accountability with federal funds. Another problem is Wildlife Services’ obstinacy in ignoring science, which clearly shows the exponentially accelerating ecological damage caused by killing off predator species. But the biggest outcry is about the inhumane and indiscriminate methods the agents use—traps, snares, aerial gunning and poisons. Ironically, these devices often pose a greater risk than the very wild animals they purport to control. Many proven nonlethal alternatives that minimize conflicts with wild animals are available, but Wildlife Services does not require landowners to use them before their trappers apply lethal force. To date, countless people and pets have suffered injury and death due to negligent use of traps and poisons. 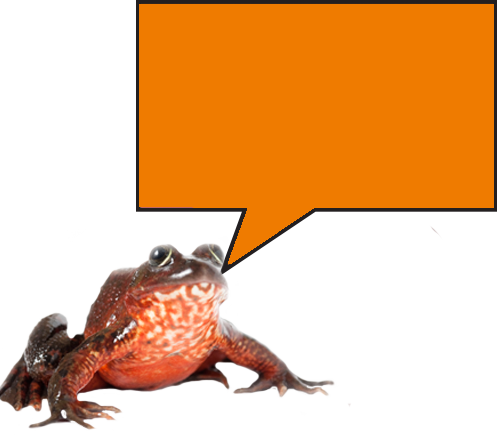 And while Wildlife Services’ own directives require agents to post warnings to alert the public, they often don’t post them. When they do, the signs are only marginally effective, as animals and young children don’t understand them. The agency has also been excoriated by The Humane Society of the United States, the American Society of Mammalogists, and many other credible organizations and individuals. “EXPOSED” won Best Short Film at the 2015 Animal Film Festival and Best Wildlife Activism at the 2014 Wildlife Conservation Film Festival. An audience question and answer session with film co-producer/director Brooks Fahy will be held after both screenings. Joining him will be Executive Director Laird Lucas and Staff Attorney Talasi Brooks of Advocates for the West, and Senior Staff Attorney Kristin Ruether of Western Watersheds Project. Together they are spearheading legal strategies against Wildlife Services in Idaho.